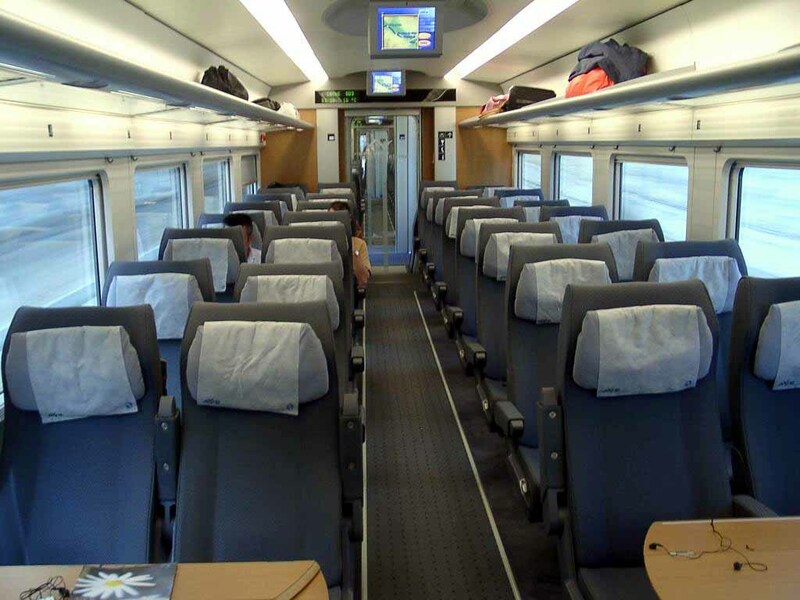 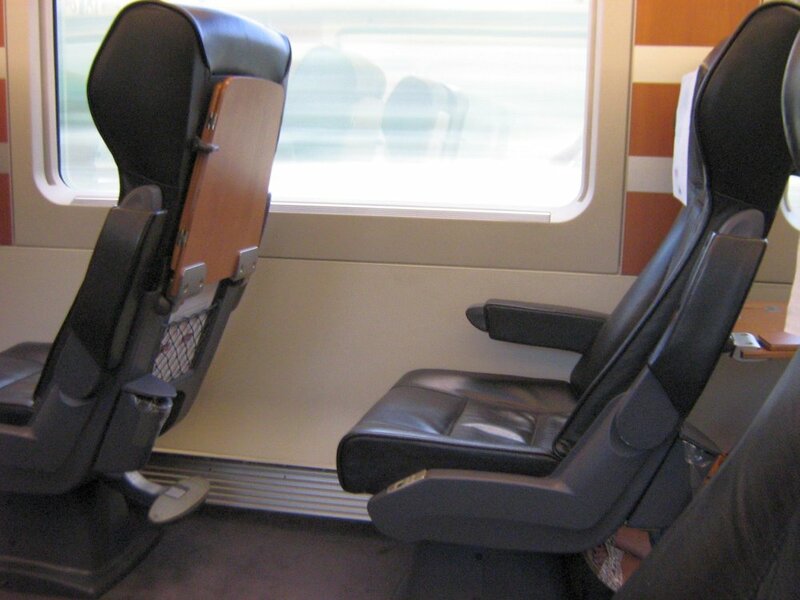 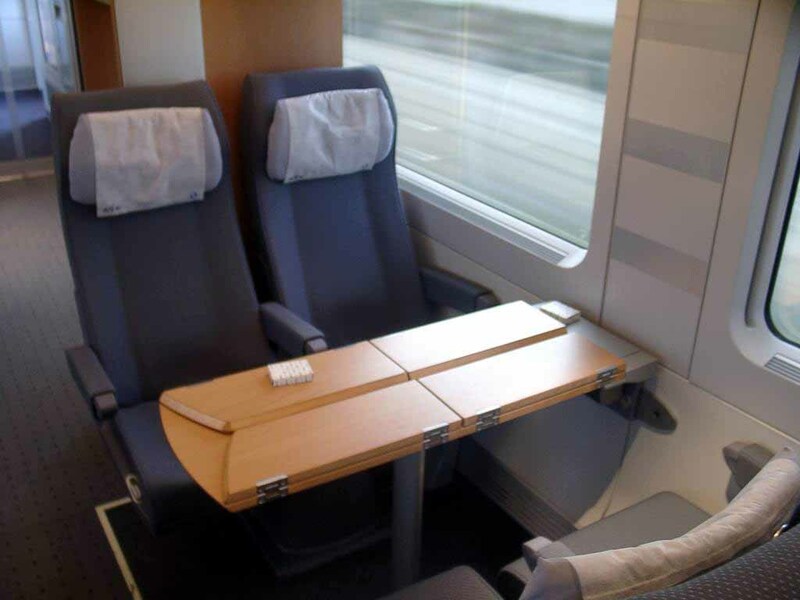 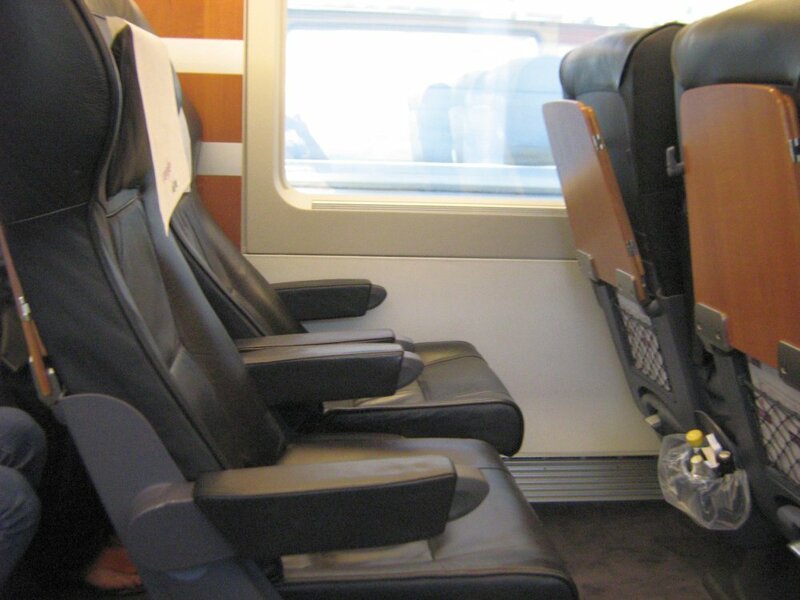 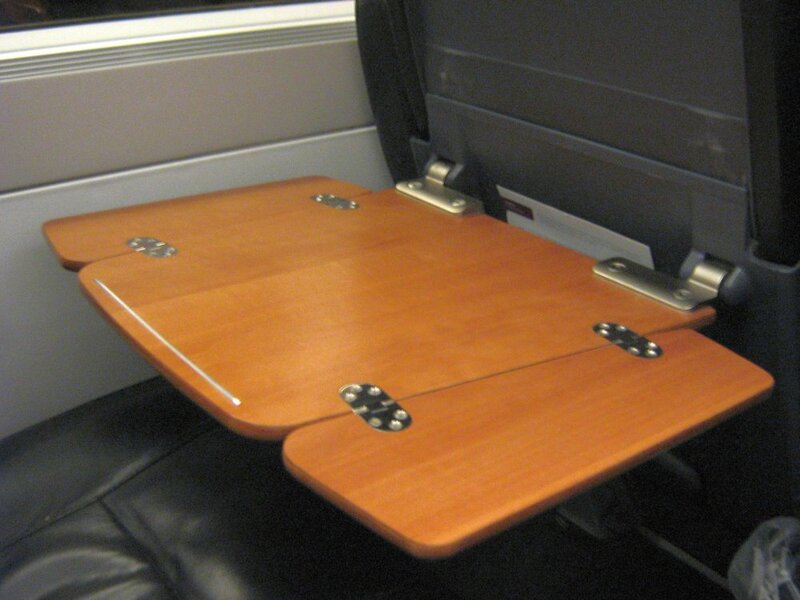 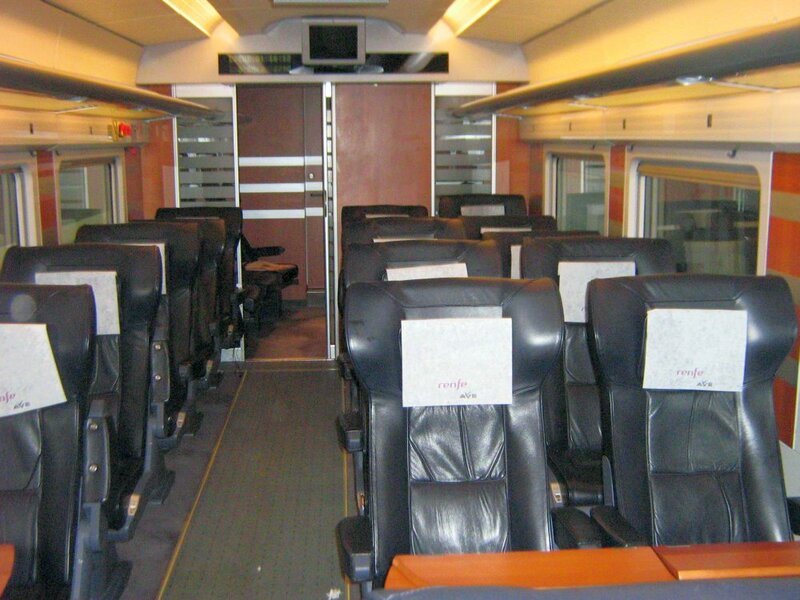 Club-class interior (Coach 1): folding, seat-back table, whose size is commensurate with the extensive complimentary catering service available in Club class. 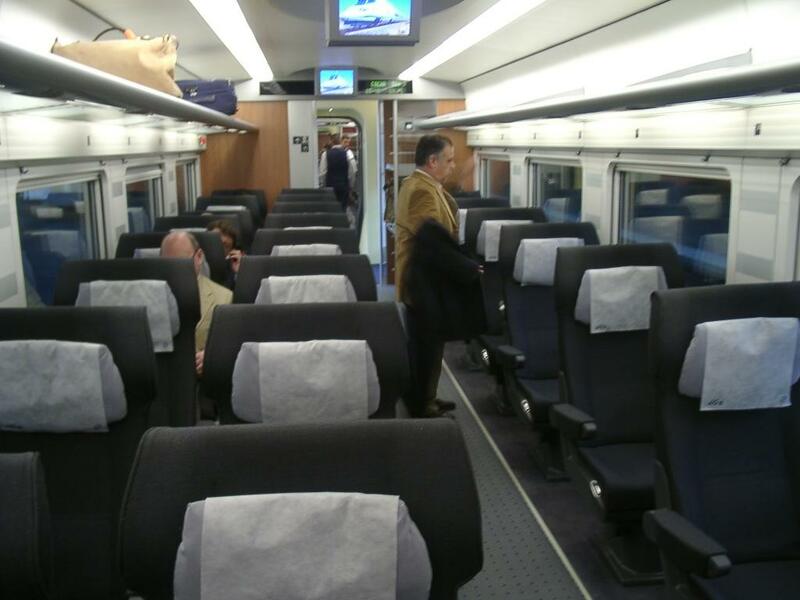 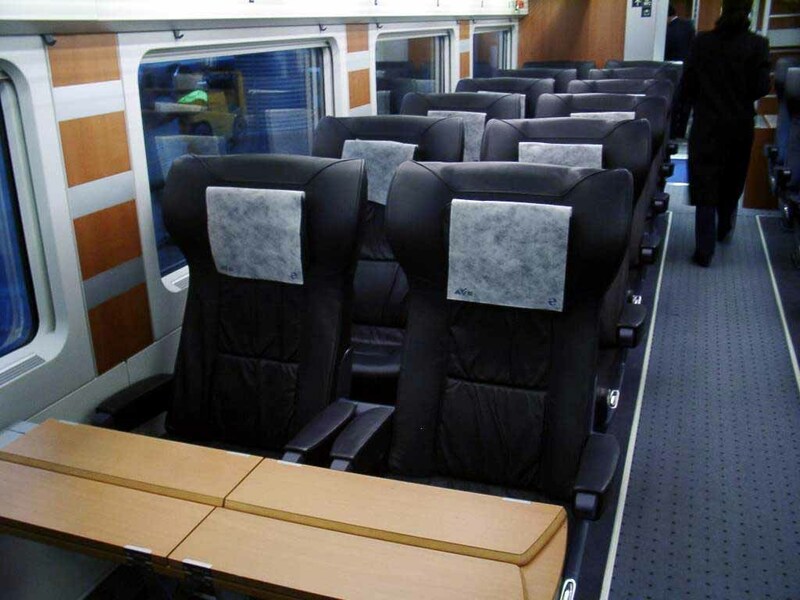 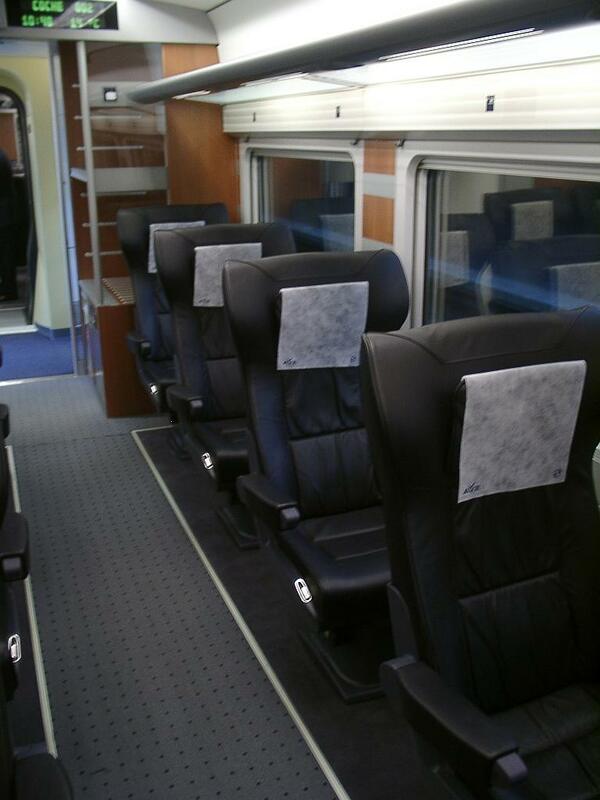 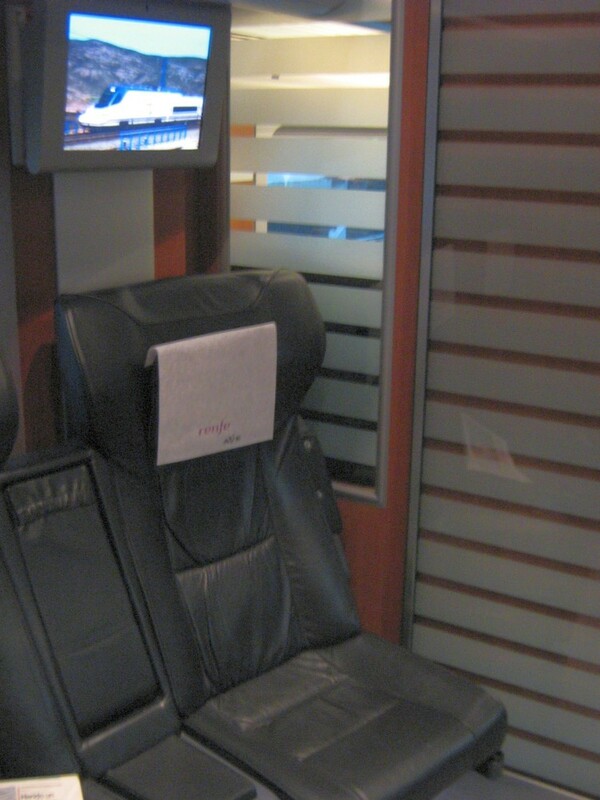 Club-class interior: Business lounge (6 seats), at the end of Coach 1. 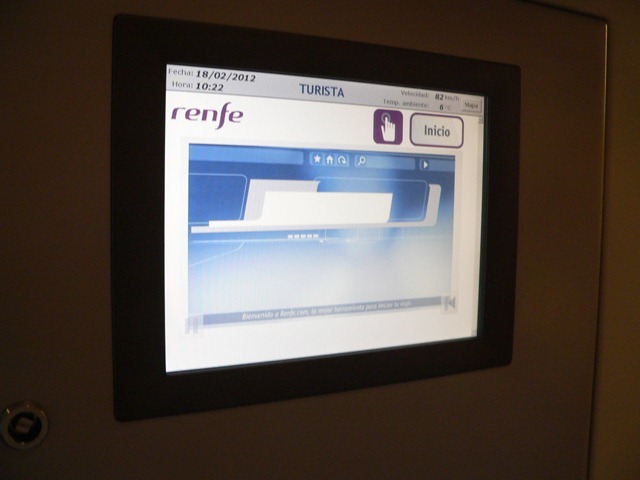 Vestibule: information screen, with real-time positioning. 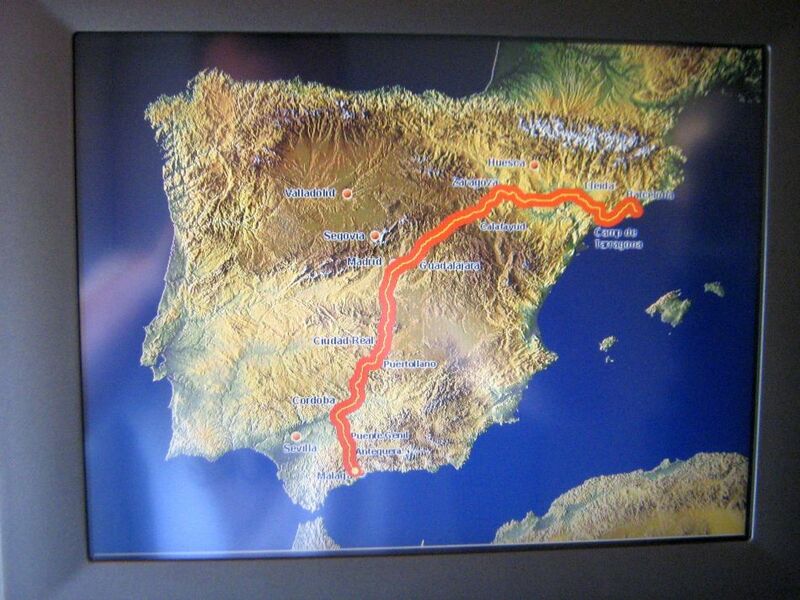 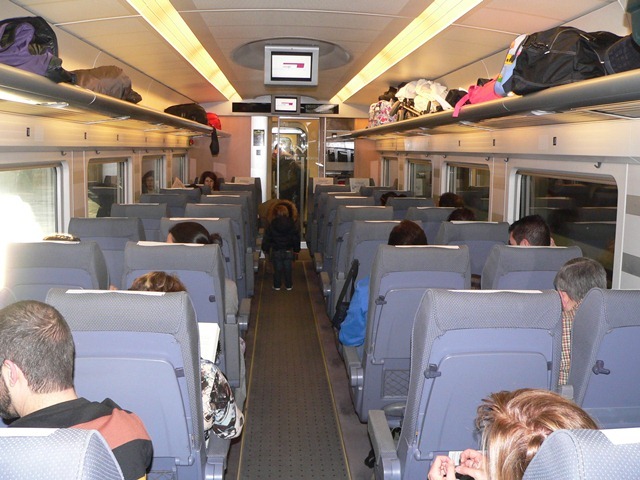 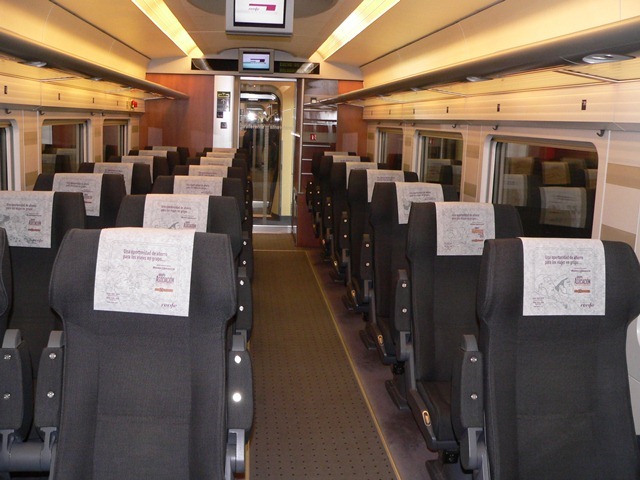 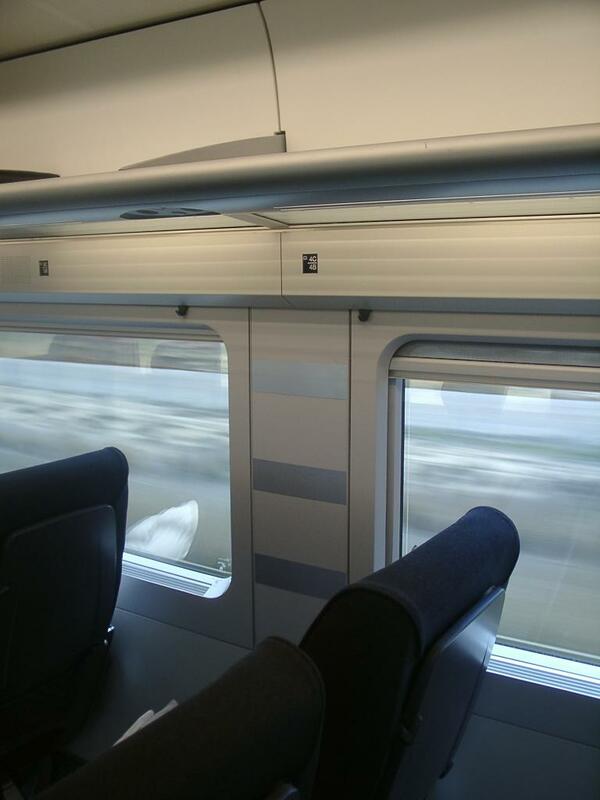 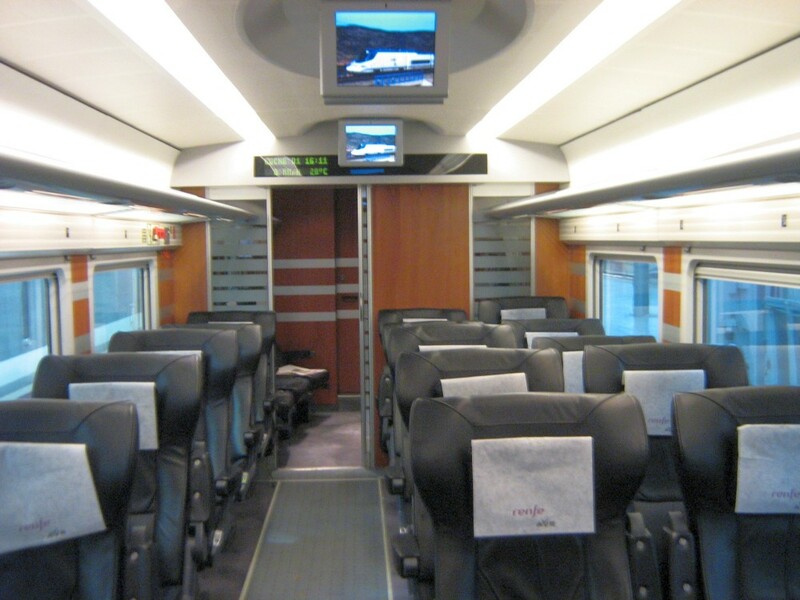 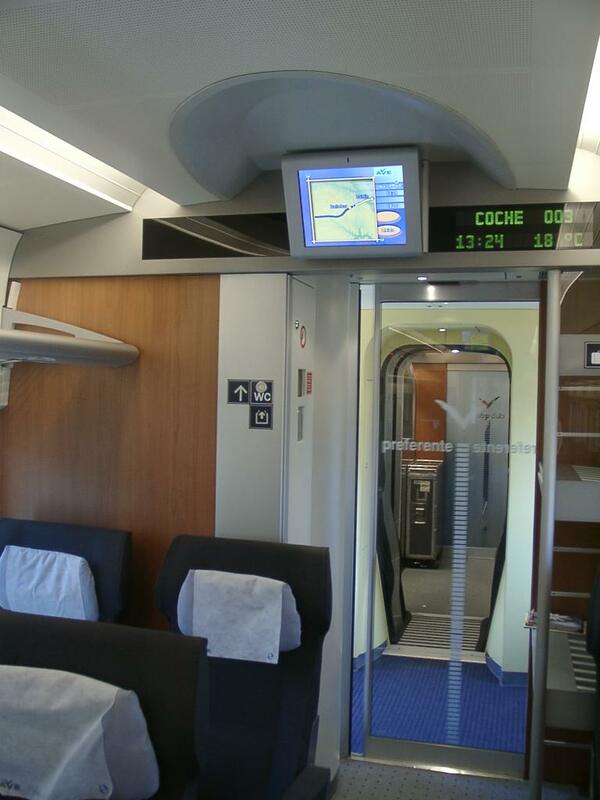 Overhead TV screens for the on-board entertainment system, regularly displaying in real time the train positioning. 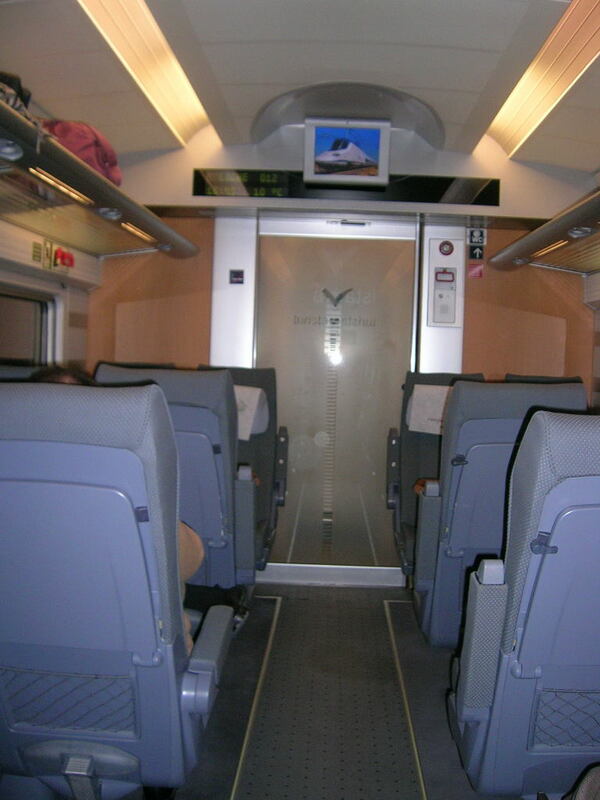 AVE 3990 (Barcelona-Sants ---> Málaga-María Zembrano, not calling at Madrid). 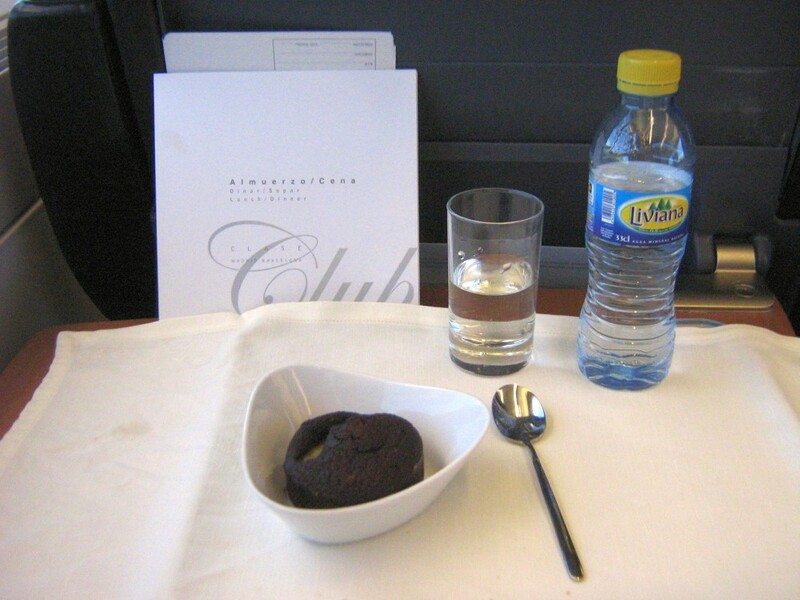 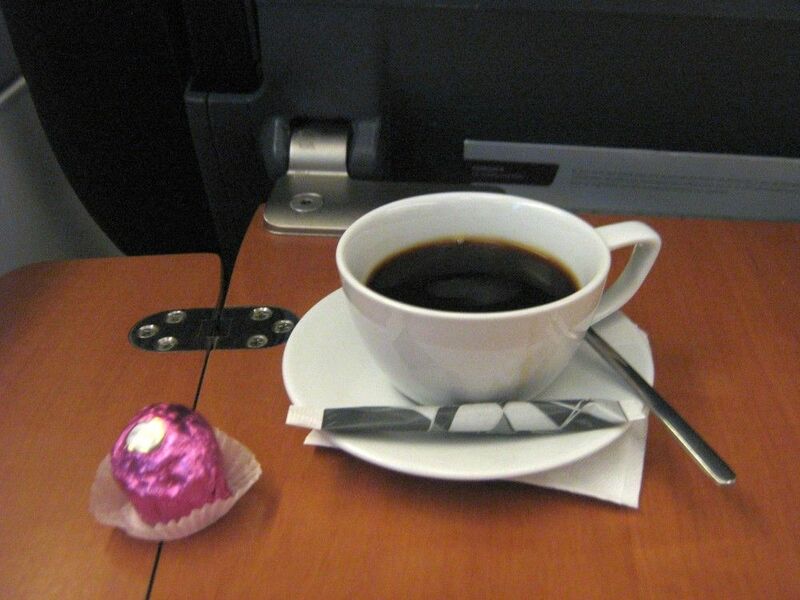 Complimentary Lunch served in Club class. 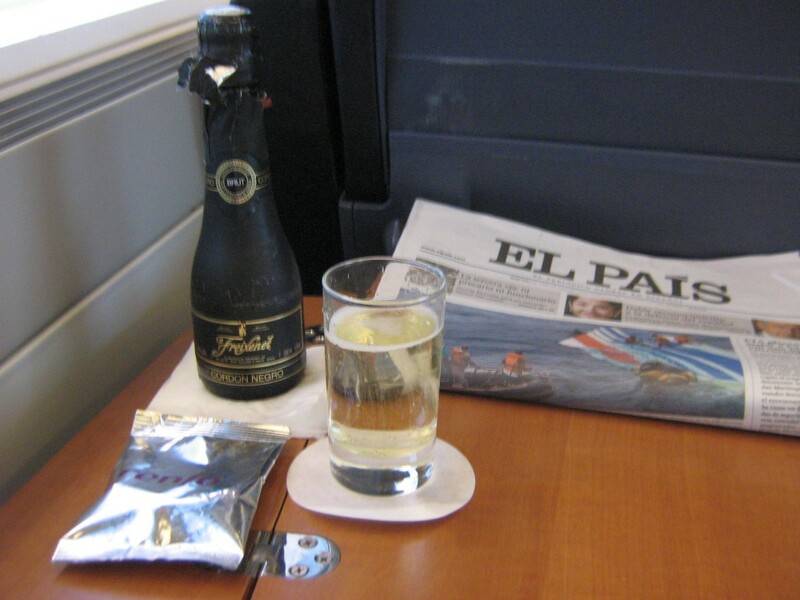 Full bar (complimentary) service was also available throughout the journey, even when running through the Abdalajís Tunnel (7.4km), notwithstanding emergency procedures. 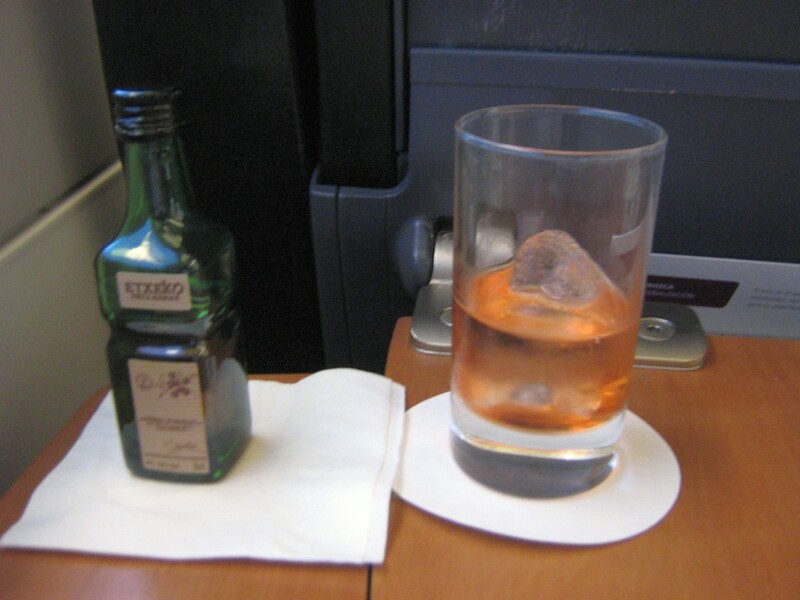 • Caprichio, Bread and Olive oil (with Lemon). 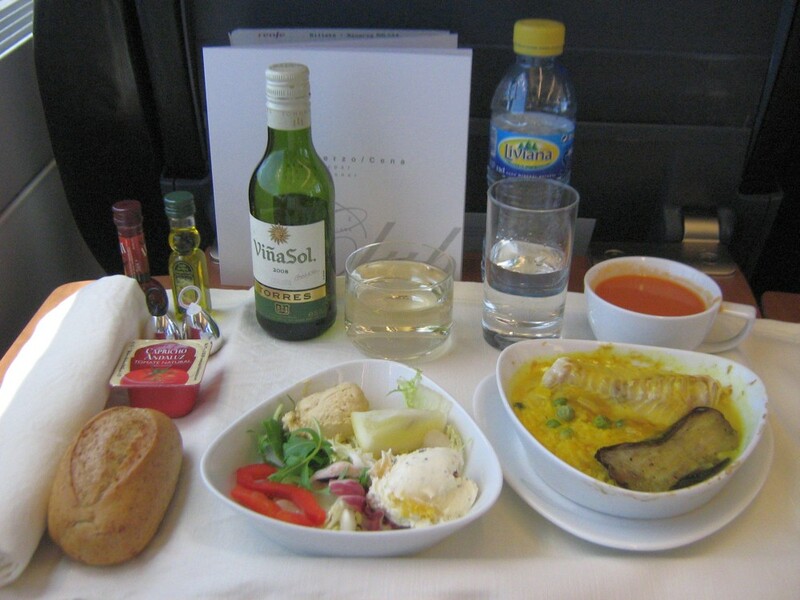 This was the Gourmet full menu. 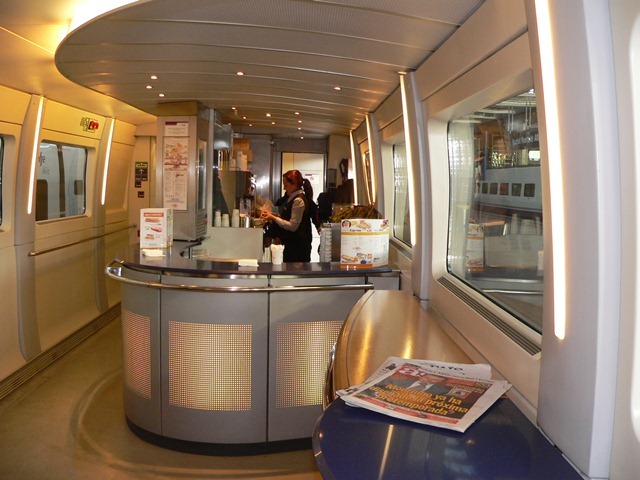 A faster option (Express menu) was also available, with 1 cold main dish and dessert. 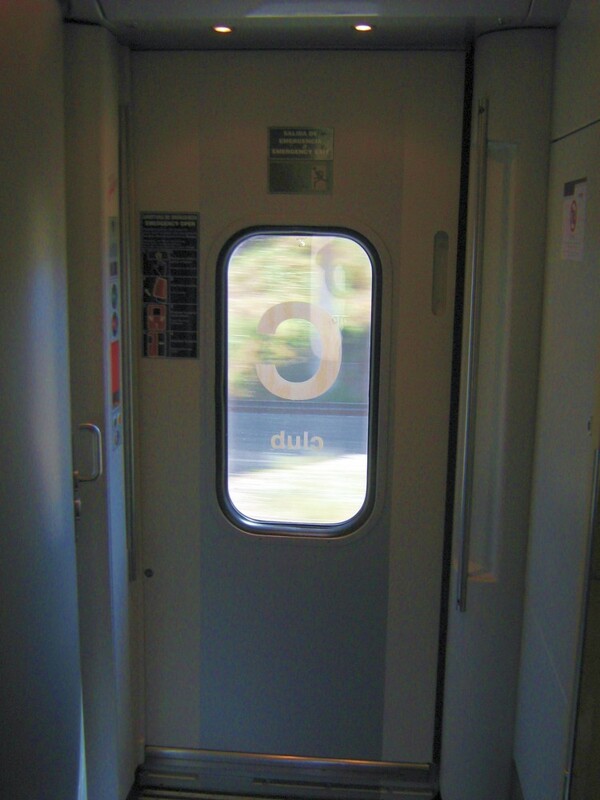 • Digestive (Patxarán - Etxeko). 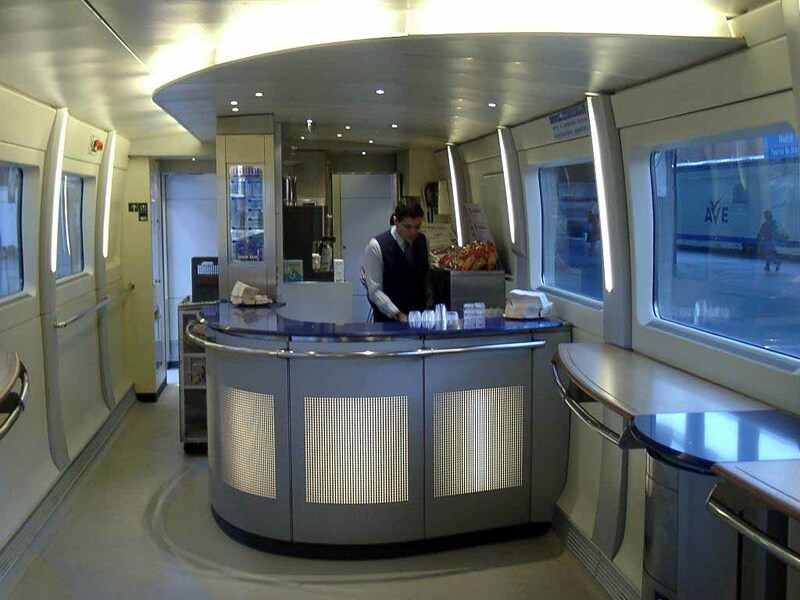 interior view of AVE S102 cafeteria car facing the counter featuring state-of-the-art designer work. 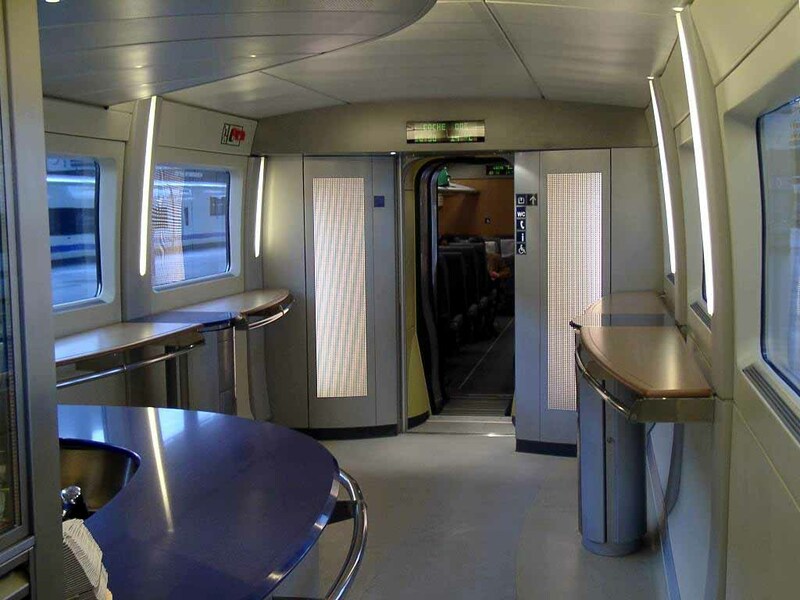 interior view of AVE S102 cafeteria car seen from the corridor next to counter featuring state-of-the-art designer work.